Let’s be honest, nobody has a pleasant story to share about their 2B exams – tales of ‘hot seat’ teaching humiliation, mind blanks and terrifying examiners are much more entertaining! 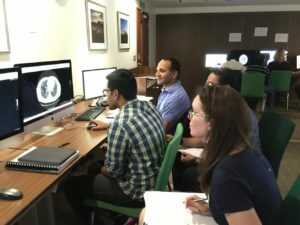 Whilst it is undoubtedly a stressful experience it will also be one of the most engaging and interesting periods of your radiology training. Consultants will have been collecting mind boggling cases for years and will dust these off with absolute glee. Never again will you see such a variety of interesting and unique cases in such a short period. If it wasn’t for the actual exam we think it could be one of the most enjoyable and engaging periods of radiology training!! 1) Get used to the hot seat!! Whilst it is not pleasant struggling through a case in front of consultants and colleagues, getting used to handling difficult cases under pressure is the single most important skill which will get you through the exam. So get stuck into presenting cases verbally in front of consultants and colleagues as early as you can. 2) It is impossible to learn everything! Some of us still don’t know what many of our viva/long cases were – the viva and long cases are about giving a succinct description, sensible differentials and a safe and sensible management plan. 3) Don’t forget the plain film rapids! This is invariably what catches people out and there are exceptional radiology trainees that fall at this hurdle. There are many websites (both free and subscription as listed below) so again start this early! 4) Try to ‘enjoy’ it???? It is very easy to feel overwhelmed and disheartened when a teaching session has not gone well – just remind yourself you want to see the cases you don’t know now rather than during the exam. Leading up to the exam it really can feel like you are getting nowhere but in the final weeks you will turn into a viva/plain film/long case genius – never again will have you have so much knowledge! 5) Do not lose faith in yourself and your abilities! You did not get here by accident – you have nailed those medical school exams, probably dabbled in some medical/surgical exams, got into one of the most competitive training schemes, somehow passed that physics exam and bashed out those 2A exams!! You can 100% nail this exam!! The college is very strict on deadlines for examination applications so DO NOT delay in submitting your application. If you can, try to submit the application at least a month in advance of the deadline, and if you don’t hear from the college after a week of submitting your application CALL/EMAIL/WRITE to confirm the application has been received and processed. Do not fail at this first hurdle! There are some very popular courses which book up early (eg Edinburgh, Aintree, Northwick park rapids). The Edinburgh course in particular can be booked up to a year in advance. It may be the case you have to book courses before you have completed your 2A exam – in this case it is worthwhile checking the cancellation policy of the course. Whilst many courses are not keen to offer refunds there may be an option to defer your place to the next course date if your 2A exam is unsuccessful. If you want to attend a course that is already booked up it is really worthwhile putting your name on the waiting list. There is no correlation between the number of courses candidates attend and their success in the exam. However the majority of people book onto 2 FRCR 2B courses on average and 1 or 2 rapid reporting courses as well. We know people who did fewer than this and passed and people who did much more than this and failed so don’t think you must do a minimum number of courses! Do not go on the courses to try to ‘learn’ material for the 2Bs or expect them to tell you everything you need to know to pass the exams – treat the courses as a ‘mock exam’. Although there is no strict dress code for the courses, it would be worth going to them dressed smartly just to ‘get in the mind set’ of the real exam as a ‘dress rehearsal’. Take each course seriously and reflect on what you did well and what you feel you could improve on, not just what the mock examiners tell you. From our experience, the courses can give you a false sense of security as they do not want to knock your confidence in the run up to the exam – so beware, the exam itself is a very different experience to a ‘mock’ run at a course! Members of The SRT get a £50 discount off the Bronze and Silver packages and £100 off the Gold package of the South West FRCR Revision Courses which is a fantastic course for the 2B exams. This is a very personal decision and dependent on your experience/job intensity/on-calls/family commitments etc. On average most candidates start 3 months before the exam date. If you start earlier then make sure you do some gentle reading rather than hitting the books hard too early on as it can be a really long slog and burn out is a massive problem. In the last month before the examination all your knowledge should be starting to come together and you should be starting to create your ‘set pieces’ for the common cases that you may be shown. In the last week before the examination try to relax as much as you can/ go over your lists of differentials so you know them well/ don’t stay up too late at night and don’t wear yourself out too much – you don’t want to turn up to the examination exhausted. If you are studying in a group just remember different people will peak at different times so don’t try to size anyone up or judge your performance based on others. You may find you are being overtaken by your colleagues early on in practice, but then closer to the exam you start to peak more than they do or vice versa. Don’t be alarmed – just try to do your best and not let other people’s performances put you off yours! There are lots of books available but the most useful, popular and common cases you will be shown are included in our recommended booklist in the Resources section of the website. Please click here to see the SRT FRCR 2B Recommended books to aid revision for your final exam. You may feel overwhelmed, helpless and stressed. You may feel like giving up and quitting the exam or even questioning if radiology is really for you. You may occasionally have radiology nightmares where you believe you have missed the exam, messed up your viva or scribed your answers in the wrong box. You may come out of each tutorial/course feeling that you are just not good enough or cut out for this. You may sometimes burst into tears for no reason. The best way to overcome these feelings is to have a good support group of colleagues, friends and family to talk to whenever you feel things are getting on top of you. It is so important that if these feelings are becoming overwhelming you speak to your clinical supervisor, trusted senior colleague or your GP. Sometimes it is easy to lose sight that this is JUST AN EXAM, an exam that many of your most respected and esteemed consultant colleagues will have failed. Try to ensure you get regular exercise, eat well, have at the very least one day per week where you don’t revise and do not try to substitute a lack of sleep with caffeine/red bull/pro-plus! If you do 3 x 2B courses (3 x avg £450) + 2 x RR courses (2 x avg£150) + Factor in the 2B exam fees (approx. £450) + completion fee when you pass (approx. £470) + Accomodation/Flights/Travel to the courses (up to £350 if travelling far away) = grand total of approx. £2920! Budget carefully! Don’t rush and panic-buy everything! You don’t need to buy as many courses as outlined above, but we do recommend that you try to save money wherever you can by borrowing books from your local medical library, your friends, buying second hand books, try to download ebooks for your kindle (which are generally cheaper than the paperback versions) or ask your mates to give you any e-books they have downloaded and can share.